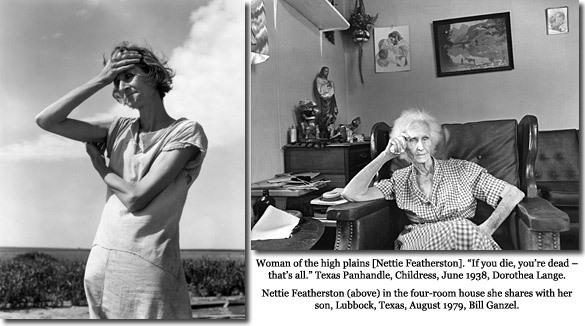 The Ingoing: Excerpt of a Conversation with Nettie Featherston. Excerpt of a Conversation with Nettie Featherston. I was reading about the FSA photographers and ran into this wonderful website. Included on it are a lot of great interview clips with people pictured in many of the most famous 'Face of the Depression' era images. "Seems like I'm not satisfied. I have too much on my mind. It seems like I have more temptations put on me than anyone. Course, that's what the Bible said, that's the way we'd be tried out. And every time I ask God to remove this awful burden off of my heart, he does." Update: Oh, I'm so behind. Apparently, you can find these interviews practically everywhere. But that's where I found them, if you're curious. this is my grandma! im proud to have her as part of my family!